Dimensions (HxWxD): 37.5"x 20"x 21"
The Swingline stack and shred 750M auto feed shredder is a high capacity shredder delivering level 4 (P-5) high security. The shredder is specially designed for destroying highly confidential information like sensitive financial and personal identification data. 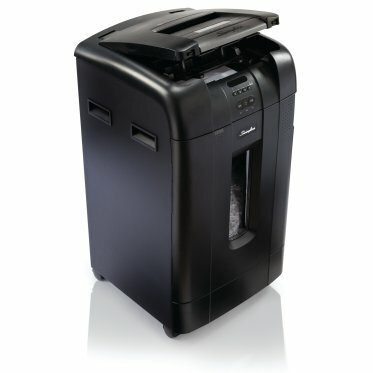 With this Swingline 750M shredder the user can tend to its other tasks in the office rather than stand next to the shredder to manually shred every document. It micro cuts 750 sheets including staples and paper clips into approximately 2000 pieces with a cut size of 1/8”x1/2”. The shred pieces fall into a large waste bin of 31-gallons. The user can keep their documents safe even while shredding. The 750M auto feed shredder has an integrated locking feature that locks the paper chamber once you start shredding. Only the authorized user can enter the 4-digit PIN code to interrupt shredding. Once the shredding process is complete, the 750M shredder automatically unlocks for another person to use it. The Swingline stack and shred 750M auto feed shredder has a manual shredding slot that shreds up to 12 sheets of paper at once. It delivers continuous operations and includes features like an Intelligent Auto + Jam Clearance technology and Intelligent SelfOil for lubricating the cutters for efficient shredding tasks. The 750M auto feed shredder comes with a 2 year warranty on machine, 20 years on cutters, with 2 years on-site service. Automatic shredding that ensures less time spent on shredding as compared to a traditional shredder. Shred up to 750 legal and letter size sheets automatically and 10 sheets manually in one cycle. Capable of shredding documents with paper clips and staples. Credit cards can be shredded when fed manually. Built with a separate slot in the auto feed tray for shredding CD’s and DVD’s. Protect sensitive information during shredding with a lockable paper chamber with 4-digit programmable PIN code lock. Prevent shredding jams with integrated Intelligent Auto+Jam Clearance technology. Intelligent Self Oil for lubricating cutters to remove build-up that causes paper jams. 2 years warranty on jams, 20 years on the cutters with 2 years on-site service.